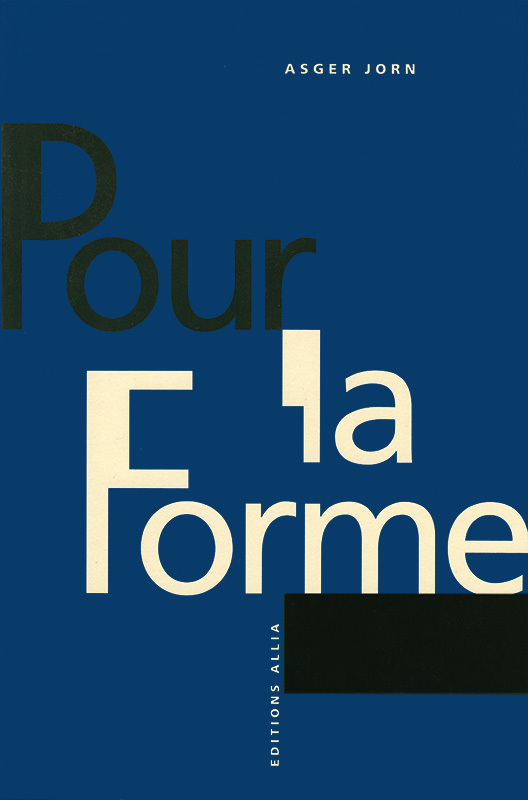 Pour la forme was one of the first projects of the newly formed Situationist International. The publication collected texts of Asger Jorn from the immediately preceding period. As Jorn explained in his introductory “Notice,” the texts collected in that book reflected the evolution of his experiments and encounters among radical avant-garde currents following the dissolution of the Cobra group (1948-1951) and leading up to the formation of the SI in 1957. Four texts (plus “Notice”) from the book were translated from the French by Ken Knabb for a comprehensive English-language collection of Jorn’s writings: Fraternité Avant Tout: Asger Jorn’s Writings on Art and Architecture, 1938-1958 (010 Publishers, Rotterdam, 2011, edited by Ruth Baumeister). First published by Internationale situationniste, Paris, 1957.